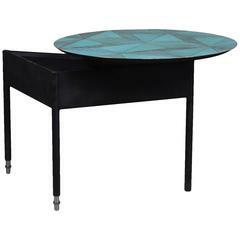 Donald coffee table has a sculptural and a cosmic aspect with colorful and circular shapes. Donald slots into the real space by interacting colors and shapes in an astral dimension. 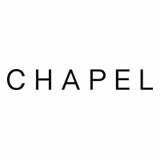 Established by Marie-Charlotte Bassi (Paris, 1989) and Diego Petroso (Naples, 1983), Chapel Petrassi is a manufacturing studio at the border between art and design specialized in handcrafted furniture, custom projects and applied arts. All of Chapel Petrassi's pieces are realized by master craftsmen at Falegnameria Petroso, an Italian family-owned woodworking factory founded in Italy in 1968. Based on a multi-disciplinary and experimental approach, Chapel Petrassi's furniture are characterized by a contemporary identity and use different languages and visual codes such as architecture, contemporary art and graphic design. 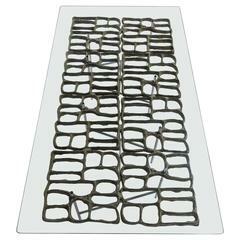 Craft and tradition merge with aspects and visions of the contemporary culture. They launched their first collection of sculpture-furniture in 2015 with the exhibition #InFurnitureWeTrust at Klokgebouw for Dutch Design Week (Eindhoven, 2015). Other notable presentations include: Ventura Lambrate during FuoriSalone in Milan (2016); Venice Design 2016, in coordination with the Dutch non-profit organization Global Arts Affairs Foundation for the 15th International Venice Architecture Biennale (2016); Tent London during the London Design Festival (2016); Objects of Desire at Design Museum of Helsinki (2016); and ALCOVA Milan during Salone del Mobile (2018). 2010 Glass, stainless steel, cryla Measures: H 34 x L 130 x D 100 cm / H 13.4 x L 51.2 x D 39.4 in. 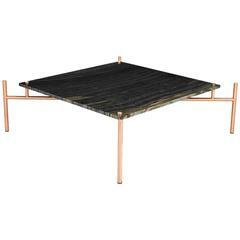 Marble coffee table with copper legs. 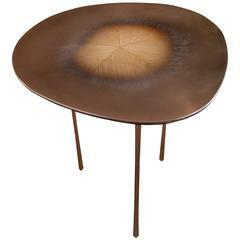 This newly made coffee table is from India and made from Sheeshum wood.